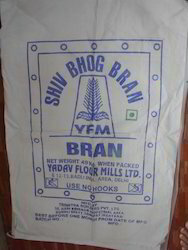 Our range of Laminated/Unlaminated PP Woven Bags & Sacks is largely being used as a substitute for jute and paper packing. These water resistant bags and sacks are light, but strong enough to handle strains. 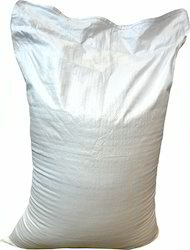 Our range of bags and sacks offer extra protection to materials like chemicals, sugar, fertilizers etc. 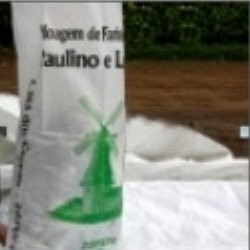 In addition, these bags also provide protection from external elements and also retain product quality to enhance storage life. Mails / letters / documents. Available in many colors like White, Red, Yellow, Green, Black etc. without any shade variation in bags / sacks. We also match the bag’ color to the nearest pantone shades. We have an automatic and manual printing machine with corona treatment and dryer. We can provide printing single side & both side upto any four colors. We use the high quality inks to print the bags and these are also approved with FDA. We use Nylon and Rubber stereo for good printing quality. We can provide the bags approved with tape test and rub test. No bag impression will be found on bags as we have the hot dryer installed on the printing machine itself which does not allow the print to come on the another Bag. v Top hemming avoids removal of the threads from the edge of the Unlaminated Bags. v Bags are Hemmed at top mainly when they are Unlaminated. v Top Hemming allow the bag to be opened easily from its mouth side. v We can stitch the entire mouth of the bag with the matching threads in a single stitch. 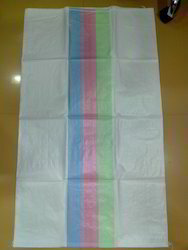 We can also offer quality Bags / Sacks in different color strips options. Bags / Sacks are made with different stripes but you will not find any color variations. The strips size, color and design are available as per your requirements & needs. We are using pure virgin raw materials without any mixtures to obtain the maximum transparency in the bags. If you want any combination like transparent with some other color or transparent window , then can be made available. We can offer you this bag with a very high strength. This bag can also be made in laminated transparent forms. We can make transparent bags with any light color shades. The PP woven laminated gusseted bags has the ability to stand vertically due to its unique construction. Also printing can be done on the gusseted portion giving it easy recognition when kept in a pile of bags. We are a leading manufacturer of PP Woven Bags & Sacks with/without Liner which are used for packaging of products like the chemicals, fertilizers, sugar, food grains etc. 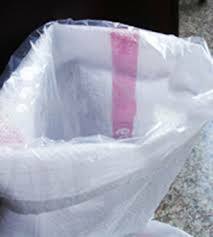 The bags with liners are used when the particle size of the product to be packed is very fine making it possible for it to ooze out of the woven bag Hence an additional liner ensures its proper packing without any leakage of material. In addition, these bags also retain product quality & ensure enhance storage life. Our PP Woven bags are the traditional bags in packaging industry due to their wide variety of usage, flexibility and strength. Can be stored in an open area due to UV-stability, up to 6 months. We have in house facility of liner manufacturing. Liner is not only protecting the products external elements but also ensures complete safety against any sort of leakage and pilferage. It is available as per below specification. 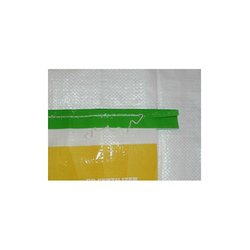 We provide liner top hemmed with HDPE / PP Woven Bag. Liner made from different type of material like LLDPE, LDPE, HM, HDPE etc. Liner is available 100 gauges (25 micron / 23 gsm) to 600 gauges (150 micron / 138 gsm) and above. Liner size is available from 25 cm to 150 cm (10” to 60”) in circular. Liner bottom seam can be made as you need like single seam or double seam at bottom of the liner or 2” to 2.5” away from bottom of the liner. HDPE/PP Woven bag is available with both side gussets. Gussets available in regular center Gussets & shifted Gussets in circular bags. Gussets can be customized from 1” (2.54 cm) from to 10” (25.4 cm) & above. We can meet the exact checks design in Bags / Sacks. The checks design can be made in any color Bags / Sacks. There will be no much color variations in Bags / Sacks. 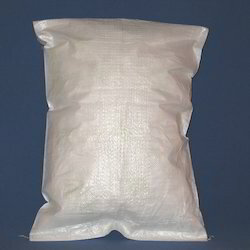 Looking for PP Woven Bags Sacks ?